Dementia is the umbrella term for a number of neurological conditions, of which the major symptom is the decline in brain function due to physical changes in the brain. It is distinct from mental illness. New diagnostic criteria for dementia were developed and released in 2013. 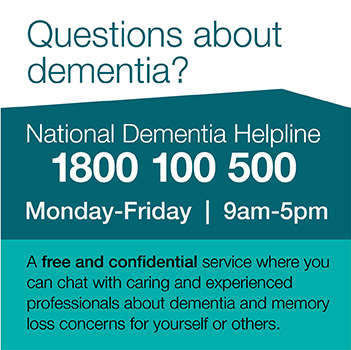 Dementia is categorised as a Neurocognitive Disorder (NCD) in the Diagnostic and Statistical Manual of Mental Disorders (DSM-5). The NCD category is then further subdivided into Minor NCD and Major NCD. The term “cognitive” refers to thinking and related processes, and the term “neurocognitive” has been applied to these disorders to emphasise that brain disease and disrupted brain function lead to symptoms of NCD. The NCD category encompasses the group of disorders that the primary clinical deficit is in cognitive function, which is acquired rather than developmental. Impairment may occur in attention, planning, inhibition, learning, memory, language, visual perception, spatial skills, social skills or other cognitive functions. There is evidence of modest cognitive decline from a previous level of performance in one or more of the domains listed below, based on the concerns of the individual, a knowledgeable informant or the clinician; and a decline in neurocognitive performance, typically involving test performance in the range of one and two standard deviations below appropriate norms (i.e. between the third and sixteenth percentiles) on formal testing or equivalent clinical evaluation. The cognitive deficits are insufficient to interfere with independence (for example instrumental activities of daily living such as complex tasks such as paying bills or managing medications, are preserved), but greater effort, compensatory strategies, or accommodation may be required to maintain independence. The cognitive deficits do not occur exclusively in the context of a delirium. The cognitive deficits are not primarily attributable to another mental disorder (for example major depressive disorder and schizophrenia). There is evidence of substantial cognitive decline from a previous level of performance in one or more of the domains listed below, based on the concerns of the individual, a knowledgeable informant, or the clinician; and a decline in neurocognitive performance, typically involving test performance in the range of two or more standard deviations below appropriate norms (i.e. below the third percentile) on formal testing or equivalent clinical evaluation. The cognitive deficits are sufficient to interfere with independence (i.e. requiring minimal assistance with instrumental activities of daily living). The ICD is currently under revision through an ongoing Revision Process, and the release date for ICD-11 is 2018. It is recommended that the ICD-10 be used for dementia until 2018.